Continued delays in building railway infrastructure, experts say, is the most pressing strategic vulnerability vis-à-vis China and it is difficult to understand as to why successive governments have not paid adequate attention to this issue. Till a decade ago, many experts posited a strategic rationale for India’s poor infrastructure along the Chinese border. They rationalised that it was an outcome of India’s defeat in the 1962 war, whereby Delhi perceived such infrastructure as facilitating the advance of China’s troops into India in the event of another war. This rationale was never officially put forth but it was no longer valid by 2006, when the Cabinet Committee on Security (CCS) approved the construction of border infrastructure — including roads and airstrips — along the China border. Even if the Indian view had changed a decade back, the outcomes haven’t. The difference in infrastructure on the Chinese and the Indian side remains stark, particularly when it comes to the railways. Having already constructed and operationalised a spectacular rail network in Tibet, China is now looking to stretch its railway link through Nepal to its border with Bihar. Chinese newspaper Global Times reported last month that this railway line will be completed by 2020. In contrast, India had, in 2010, identified 28 strategic railway lines in areas bordering China, Pakistan and Nepal. Not one of them has progressed till date. Some of these lines were in fact first thought of more than a century ago. The official proposal for 28 strategic railway lines along the northern borders was sent by the Army headquarters to defence ministry in January 2010. That month itself, the then defence minister, AK Antony accorded “in principle” approval to these railway lines. “Our criteria for selection of these 28 lines was two-fold. One, these were the railway lines close to border areas which were significant from the point of military strategy. And two, they augmented or supported the movement and sustenance of our combat power during war and peace,” a senior Army official involved with the proposal in 2010 told The Indian Express. After a series of interactions with the railway officials, the defence ministry reappraised the proposal in November 2010. It now prioritised 14 of the 28 lines for construction initially. In December 2012, Antony confirmed the same in the Lok Sabha when he described these 14 lines as being strategically important for national security. Preliminary survey for 10 of them was completed, but work did not begin on them despite the fact that these rail lines were declared national projects. The railway ministry did not wish to fund these projects as they were not commercially viable. The defence ministry asked finance ministry for additional funds but the Planning Commission said these were not priority projects. No decision could thereafter be taken about the funding, and the railways, finance and defence ministries could not agree upon allocation of funds even for the Final Location Survey (FLS). Because of the tough terrain and the fear of cost escalation, the railways insisted on a FLS and a detailed project report for arriving at the project costs. It was a departure from the standard practice of allocating the funds for a project after a preliminary survey, and this further delayed the projects. “Lack of adequate infrastructure on the borders is one of India’s most pressing strategic vulnerabilities vis-à-vis China. It is difficult to understand why successive governments have not paid adequate attention to this issue. Rail infrastructure, in particular, is vital for moving large forces and equipment to the borders from outside the region,” says Professor Rajesh Rajagopalan, professor of international politics at Jawaharlal Nehru University. 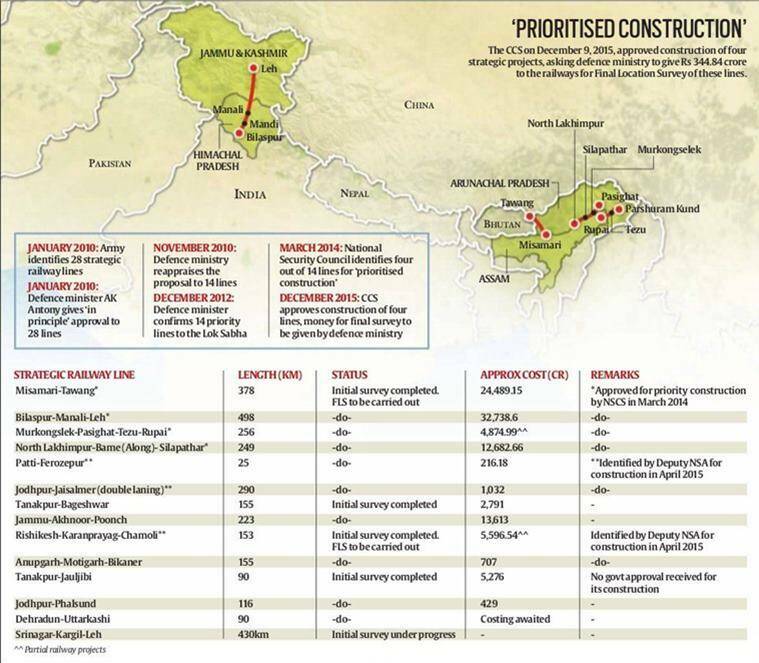 There was little further progress and the matter went to the National Security Council, which in March 2014, identified four out of these 14 lines for “prioritised construction”: Misamari-Tenga-Tawang, Bilaspur-Mandi-Manali-Leh, Pasighat-Parshuram Kund-Rupai, and North Lakhimpur-Bame-Silapathar. The proposal was taken up by the Cabinet Committee on Security on December 9 last year, which approved the construction of these four strategic projects. It asked the defence ministry to give Rs 344.84 crore to the railways for FLS of these lines. Since then, the railway ministry has given a three-year roll on plan for starting the FLS of these four projects this year. It expects the defence ministry to allot the funds in the current financial year. The railway ministry has already constituted an operational committee comprising representatives of defence ministry, finance ministry, ministry of roads, department of border management in home ministry, concerned state government and the Army headquarters. “This committee will advise on inter-se priority and timelines for implementation of these projects, involvement of modern global technology and necessity of road construction along railway lines. We will also co-opt relevant non-government members as experts,” explained a railway official. The defence ministry has simultaneously established a steering committee headed by Secretary (expenditure) to look into the mechanism for financing these four projects. It will also coordinate with various agencies for their completion. The Army headquarters has established an oversight committee at Delhi, and two more at its Northern and Eastern Commands. The nodal officers at these two commands will coordinate with Northern and North Frontier railway zones. Experts, however, remain sceptical of the success of these projects. They cite a lack of political will which has resulted in lack of funds for strategic projects. A senior military official told The Indian Express that a CCS note on infrastructure development along northern borders, with an outlay of Rs 28,732 crore, is awaiting tabling with the CCS since September 2014. If that is sanctioned, it will address existing infrastructure voids along northern borders. “Early sanction of the CCS note has been reiterated with the defence ministry many times. It has also been raised at highest political levels by the military leadership but to little avail,” the military official confided. Besides high costs and lack of funds, the tough terrain for these lines also poses a challenge. Experts say India does not have any experience of building rail tracks at high altitude and in tough terrain of the Himalayas. But strategic imperatives dictate that India will have to overcome the technological challenge, whether indigenously or by foreign collaboration. “Building the railway lines is critical considering the emphasis that Indian decision-makers have given to the possibility of a two-front war since at least 2010. There is some movement on road infrastructure and development of small airstrips. But building the rail infrastructure is vital,” said Professor Rajagopalan. The inordinate delay in building the vital railway lines on the northern borders tells us that even if India has shed its old defensive mindset vis-à-vis China, it still has a long way to go in matching China’s aggressive infrastructure building capabilities.